Size:3XL——Bust:118cm/46.5″——Sleeve:20.5cm/8.1″——Length:69cm/27.2″Plus Size Blouses For Women Fashion 2018 Loose Fit Women’ s Top Cozy Short Sleeves Shirt. Lovely Casual tunic shirt for daily, going out, party, work, casual wear. sweet fall,winter,spring look! 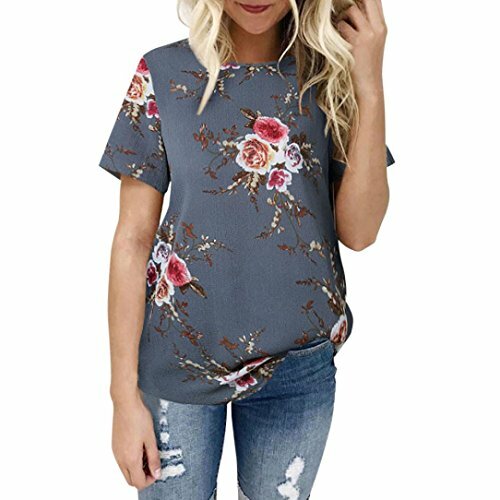 Women’s Tops Tunics T-Shirt Dresses Flowy Tops short Sleeve Blouses Soft material paired with the cutest detail front bottom hemline. Good for Work,Meeting,Party, Club or even night out.